We left our slippers outside and entered the temple's drawing room. I took a seat and eagerly waited for the idyllic experience to unfold. Here, a special ceremony... one that holds prime importance in the living of Japan, was to be observed. 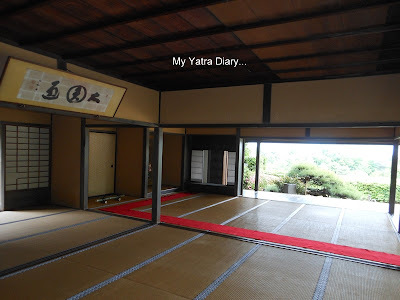 Tucked away in the lap of nature, we were at the zen temple in Nara - peaceful, silent and serene... a world unto itself and the lovely people guiding us, once again, were cosmos and sarah. Narrow cobbled trails winding upwards and enveloped in all shades of green had brought us to the drawing room of the temple where we were to experience the tea ceremony of Japan. Also standing in the temple complex was the main temple and a beautiful garden amongst similar other structures. The drawing room’s (or the tea room's) beauty lied in the sheer simplicity in detailing. Tatami mats covered the wooden floor, flower vases adorned the various nooks and corners and a certain degree of warmth swayed in its air. Overlooking the room was a beautiful garden which was only adding to the serenity of the place. As we took a seat, I observed cosmos and sarah sitting in a peculiar position. Taking cue, I messily tried for the same but loosened up soon enough after learning that it is more important to enjoy the ceremony, rather comfortably. I was pleasantly surprised to see that the rules to be followed weren't strict, instead more emphasis was laid on relaxation and leisure, thus ensuring complete joy in the activity. The ceremony started on a sweet note... with a sweet followed by the tea. After gorging on the little sweet thing, I was left craving for more. The tea came in soon after. Before I could get down to drinking it, I was directed to rotate the bowl 3 times in the anticlockwise direction and the action was to be repeated after finishing the tea. I learnt that this action signified respect for the host. "a ritualized sequence of movements, a formal dance of significant gestures, designed to purge the mind of irrelevancies, of petty or personal things." Staring through the window of nature, I started sipping my tea slowly. The realization that the tea tasted a lot bitter than I’d imagined it to be, sunk in much later. Its bitterness had been amply compensated by a lot of beautiful things it had bought along with it. The view of the distant hills, the rolling meadows, the green grass and the quiet silence had all worked in unison to transform the room into an ideal setting for a ceremony, a prayer. One thing that I like about these ceremonies is – One time, one meeting. Who could have ever thought that a simple cup of tea could give you not only a sense of fulfillment for your tummy but also for life? This was a ceremony where tea was the prayer, those silent moments our meditation. To delve within, to reflect, to connect... then, became easy. I was the first one to gulp it down completely and proclaim it tastes so much like bittergourd juice, thus breaking the silence for a few sweet smiles. 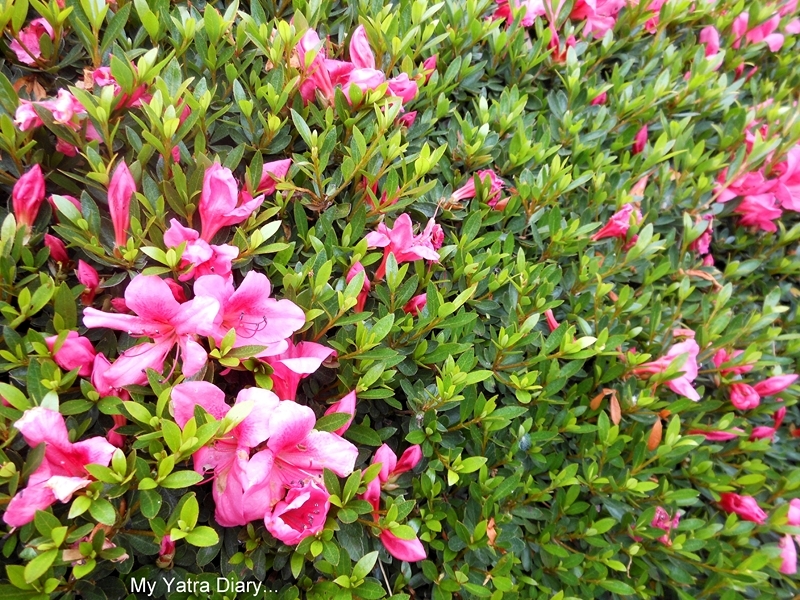 After having tea, I hopped out onto the neatly manicured garden, full of green shrubs and pretty flowers. further enhanced the spirit of fulfillment, both outside and within. 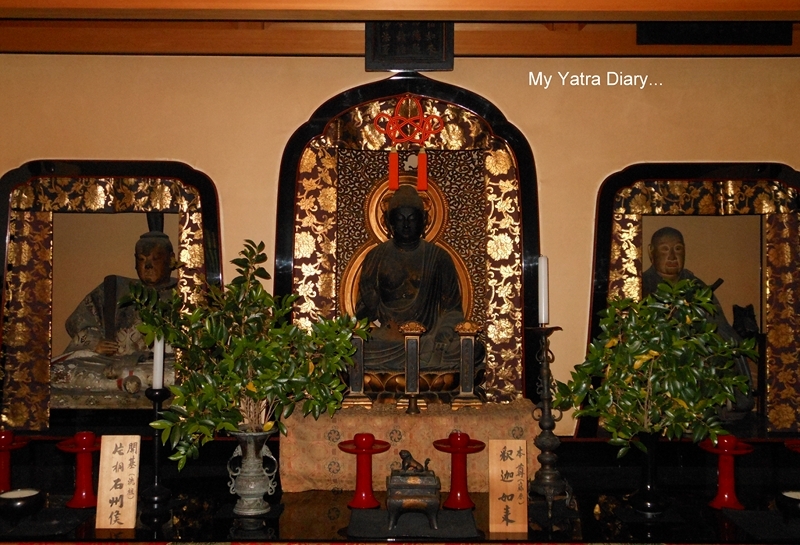 On a richly colored altar in the main temple room, sat figures (from left to right) of the founder – Sekishu Katagiri, a feudal lord of the area who had founded the temple in 1663, the Buddha and the priest who had been the inspiration behind the building of the temple. The highlight of the temple, however, was the ceiling above which had a speaking dragon. the more fortunate you are. My first clap didn’t enliven him much, so I kept on going till I was assured by everyone there that I had gotten the best out of him! 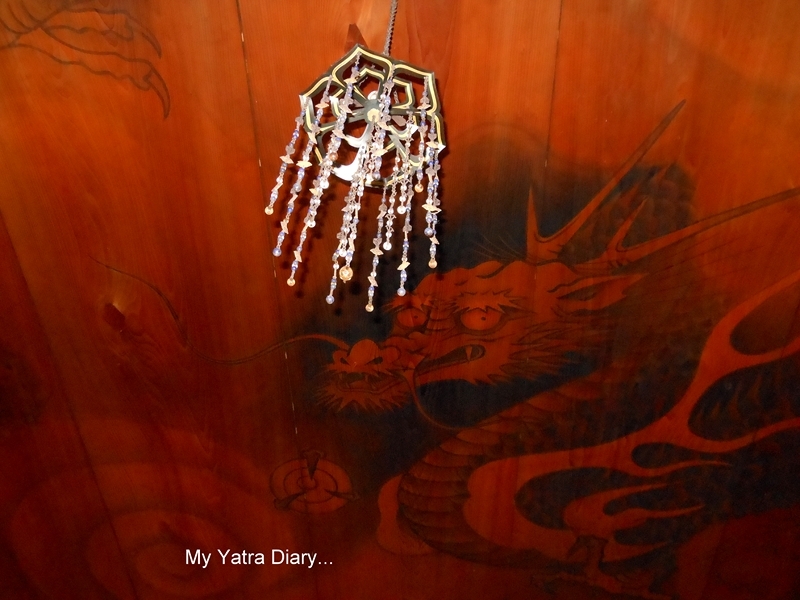 With the dragon’s voice still throbbing in my ears, we came out of the temple and prepared to leave. As I put my pair of slippers back, I realized... I was feeling a lot lighter than before and a bit fuller too... both at the same time. How to reach: 15 minutes walk from JR Yamato Koizumi station. Fees: 1000 yen per person. How have you been? I missed so many of your posts, will go through them now. I wish to go to Japan one day. Such a beautiful and informative post. So beautiful, so spiritual inside out. How utterly magical! I'd love to attend a real tea ceremony. Such a fascinating, beautiful place and so much history!! Coming from such a young country, I'm always fascinated by countries with so much history going so far back in time! Superb captures and great information, Arti!! Thank you, as always, for sharing your adventures!! Hope your week is going well! I experienced a tea ceremony in Tokyo in 2008. I, too, had to eat a piece of candy to counteract the bitterness of the green tea. Shinto music played in the background. The ceremony was followed by a walk through the garden and around the lake. Thanks for your post, Arti. It brought back wonderful memories. And congrats on reaching your 3 year blogging mark last month! The garden is wonderful! I imagine the Temple would be hard to get to, navigating upward so high. Is there a way for handicapped people to go? The tea ceremony reminds me of the high teas in England, full of all kinds of little steps with the cup, each part of it has a meaning. I love the simple beauty of Japan. Nice dragon! I would have clapped loudly and many times as well! What a lovely post it is! 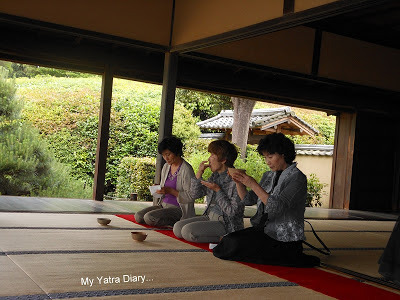 Now you know the essence of tea ceremony based on Zen Buddhism better than I.
Arti, me too. How I love this spirit "One Time One Meeting". Your post reminded me again of the essence! I am very glad that you mentioned about "One Time One Meeting" so nicely. In the middle of a vast ocean, one water bird meets one sea turtle by chance. They will never see again. This is "One time One Meeting". But even though we meet each other many times, each meeting is so special and never the same. This is also "One Time One Meeting". Honestly speaking, I haven't visited this temple yet. Oh, your post makes me want to rush to this temple right now. Everything is so neat, peaceful and serene; it makes you feel more calm and lighter! Beautiful place. It feels so nice to read about such interesting cultures and ceremonies. Thanks for sharing this. The place looks so serene and calm. The tea ceremony is very interesting.Loved this concept- One time, one meeting. as if it were only this time and only this meeting. @gigihawaii: Since you have spoken about shinto music, I’m guessing your experience was in a shinto shrine. Did you sit in that position and do you remember any rules that you might have followed during the ceremony? I don’t think there was any music for us, but the garden definitely made for a perfect setting for the ceremony. Thanks for sharing your experiences, I love hearing about them. @Ginny High teas in England, I’m sure, would be something of an experience too. 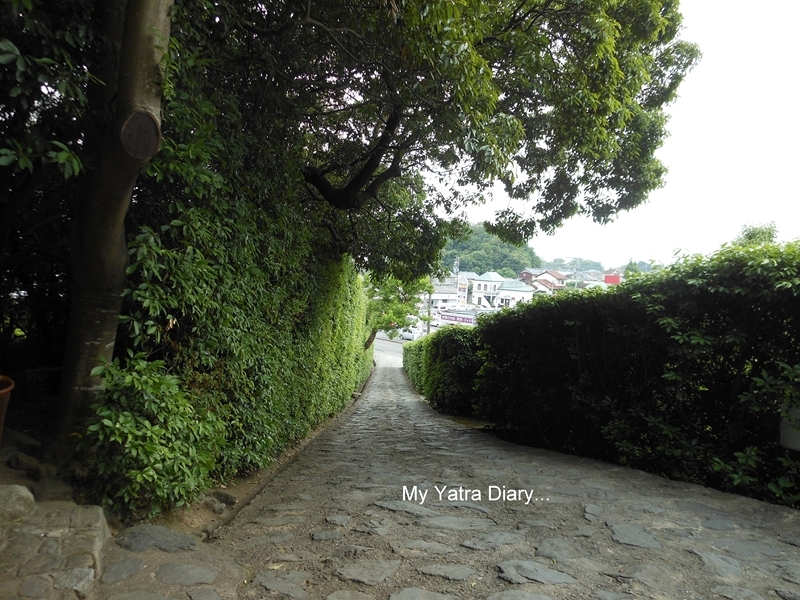 Though the temple isn't very steep but there is a slight slope one has to ascend. I am afraid I don’t have any knowledge on the wheelchair facilities but there is a high probability of such a facility being in place, knowing how thoughtful Japanese people are. @snowwhite The essence is indeed very beautiful and one that has so much of depth in it. I was a bit unsure if I had got it right, since a lot of time has passed and I don’t remember the exact words of cosmos today. The tea ceremony is so nice. I have never tried it although I'm Japanese. It must be so fun and make us calm. @Arti Awesome place, Beautiful photographs,Great description. Thanks a lot for sharing the post. Amazing, how orerly and organized everything is here - so carefully tended - it sure influences the people a lot! Great place , lovely pictures and wonderful information . Haha..bitter gourd juice..:) Thank you for taking us on another wonderful trip, Arti. Good to know about new countries, new cultures, new traditions.. I am amazed how well you put it altogether.I am really glad you liked this place. Yes, I remember we were talking about "one time, one meeting or one life" as a spirit of tea ceremony. I like that idea and you got it more than enough; every moment should be priceless because each encounter should be that special and never the same and it really was! Jikō-in is not so famous as Hōryūji or Todaiji but just like a hidden treasure. Thank you for this loving post,Arti. 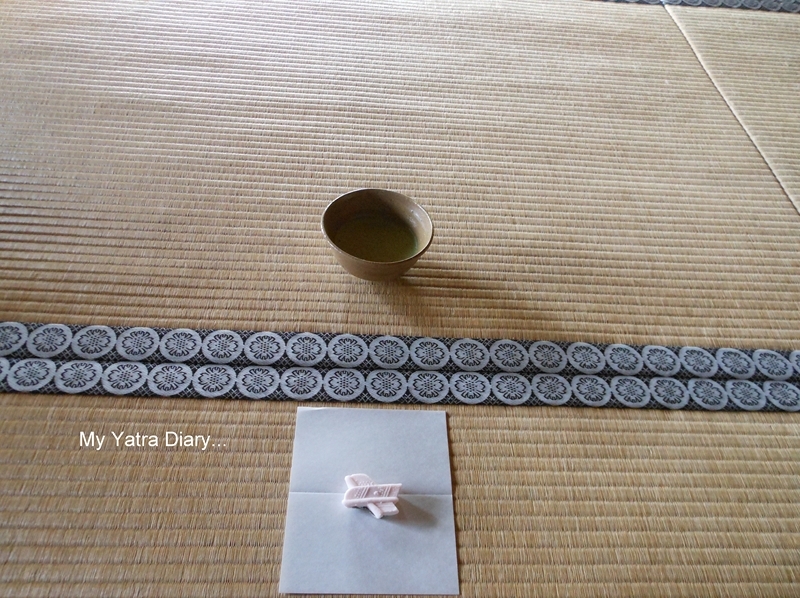 @ALL: If you visit Japan, do not miss out on the experience of a tea ceremony. IT is one of the must-do things while you are there. @gigihawaii: Thank you for the links, loved reading the posts especially the one on Ginza since that is one place that we wanted to visit but missed out unfortunately. Very peaceful and beautiful. Thank you for sharing this lovely place with us. Oh yes, tea time is one of my favorite times. It is very relaxing on a hectic day. It looks like you love travel and photography like my daughters and I. They like to see the different cultures and traditions of people. Thank you for visiting us at Red Rose Alley. Have a sweet day. I've always wondered what a tea ceremony would be like but never considered how the tea might taste. It does look peaceful though I think I'd enjoy a stroll among the gardens just as much. 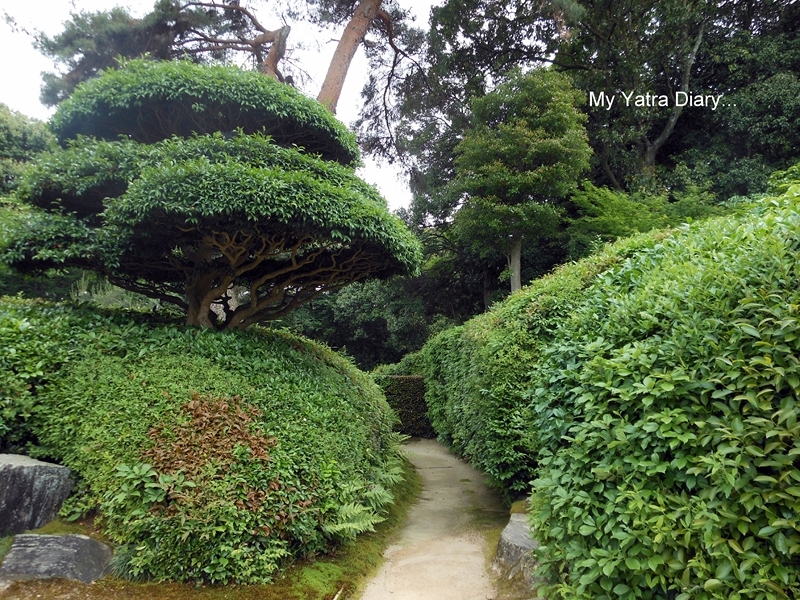 Visiting Japanese gardens has huge appeal. Arti, you expressed so nicely your experiences and impressions. 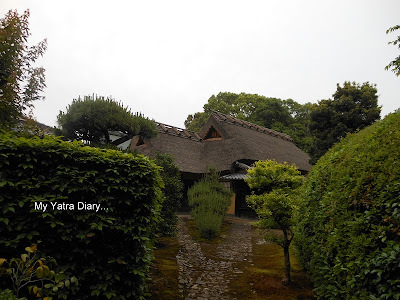 As cosmos mentioned about tea ceremony, I’ll add something about the architecture. As you already know, traditional Japanese windows are different from the western style windows: the view from the western windows is like a framed painting, while view from the wide open Japanese sliding windows make the room completely one with nature. I’m taking care of my 2-year-old granddaughter from tomorrow for a while. My life will be revolving around her and I’ll be mostly off-line. Please be patient for my tardiness and I’ll visit you when I have time. @Here I am/Carrie: I absolutely loved your perspective. I would so love to live that kind of a life too. @stardust: Wow, that is a very unique way to establish commune with nature. I am loving my learnings in my virtual tour as well just like the real one. Thank you very much for sharing, Yoko. 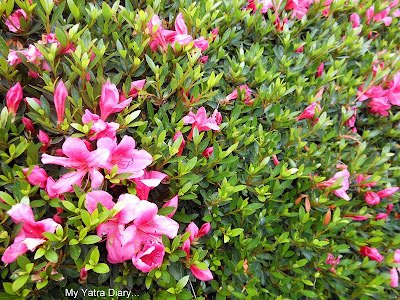 Arti, I don't know how I missed so many interesting blogs!! 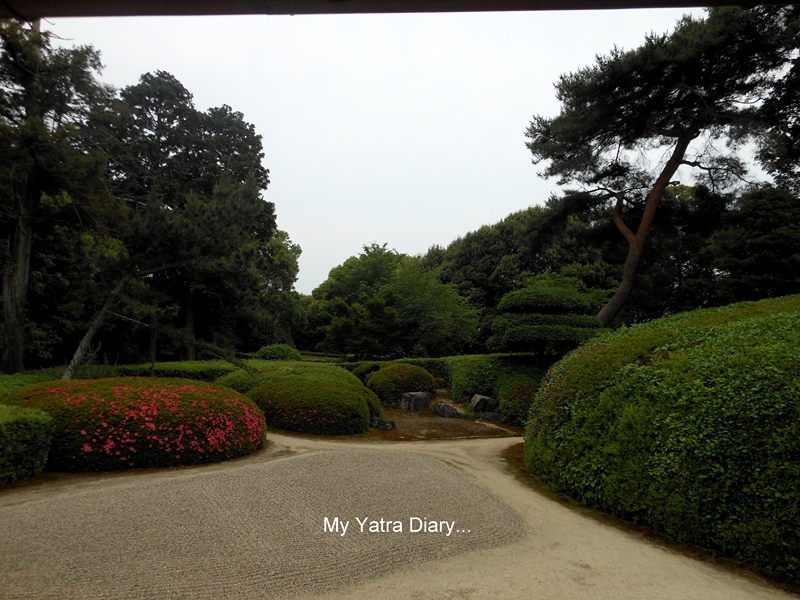 The place looks so serene and peaceful.Enjoyed strolling with you through the garden. And the tea-ceremony sounds exciting. So, is it bitter in taste? I'm glad I didn't miss this post, Arti. I've not been visiting blogs much. Tea as prayer and your enjoyment of the ceremony with blog friends pleases me. I'm drinking tea right now and thinking of YOU. Wonderful, I've seen the "tea art" in China, I love such traditions and how they are proud of them! A temple, amidst nature, what more can one ask for; for a serene and a tranquil mind. Nice experiences. I think this was more of an informal tea ceremony. The formal one can be much more elaborate. am glad that you observe Jikoin-Temple well. To tell the truth we hesitated if we take you this temple because this temple is not famous but I thought this temple has simple beauty of zen. @sarah I remember you asking me, which temple I had liked more, this one or Horyuji and I had told you - This one. Thank you for including this temple in the itinerary, I absolutely loved admiring the simple beauty of zen with an equally beautiful company. What a beautiful ceremony, Arti! You were very fortunate to experience it. Good that you were able to take these wonderful photos and share them with us. Seeing this post only now, thanks to a tweet by a friend. Your Japan series is absolutely fascinating. The simple manner in which you have communicated the complexity of the tea and the ceremony will open tea up to many who might not have given it much attention till now. Lovely pics, and lovely post. i like the way the japanese sit (in the 3rd pic) while they have their food .. we find it hard to sit for look in this posture! 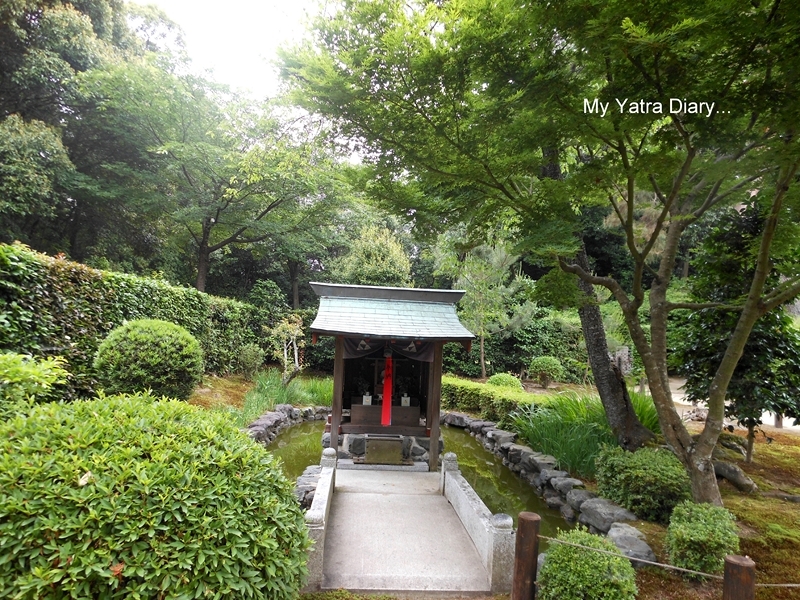 Wonderful temple with beautiful garden. Would love to participate in this ceremony! This is interesting. May be some day I too will. I feel so refreshed and light by just reading your blog and viewing your amazing photos of the event..
Hope I get to go someday....they are amazing! Such beautiful tradition and customs...unique to each place; some strike a chord and some are rare. Whatever it is one enjoys all this esp if we are wanderlust; at least travel loving! I really wish I could travel to these wonderful places too;Some Day! Last year I'd been to the Japanese Tea Garden in SF and found that they have Tea ceremonies. I've been wanting to try it but it happens in the middle of the week and so at this point it doesn't work for me. I'd been very curious about it. 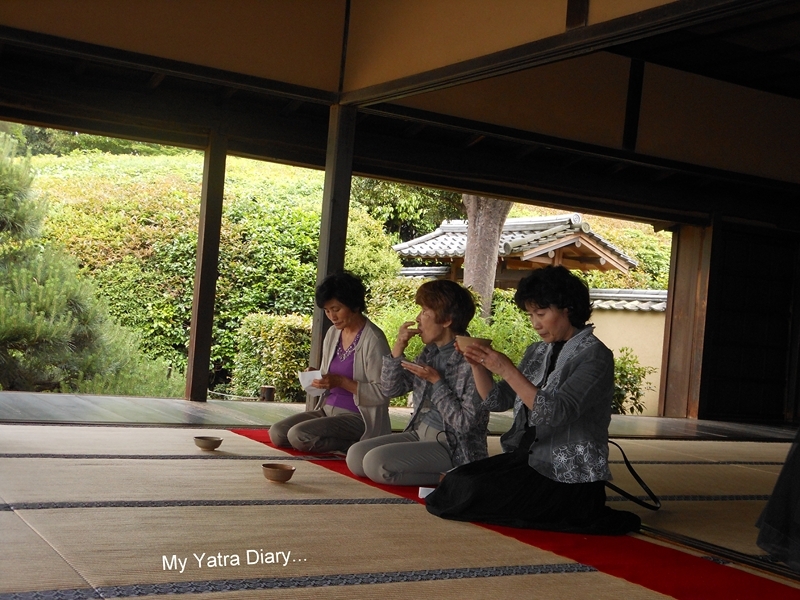 Really nice to hear about a Tea Ceremony, here on Yatra Diary. I heard that the tea is an acquired taste, much like wine. Not our milk masala chai, how did you find it? lovely place. and beautiful clicks. WOW! I think you have great experience.Lovely place. You brought the entire ceremony alive for readers. Shall surely try one when opportunity comes! Lovely Arti! Japanese Tea Session always attracted me...Going through some of your posts on Japan the one thing that comes to the fore is respect for space and serenity. All the places that you have pictured are so well maintained. It shows how they value their heritage. Silence speaks in Japan. Wish I could go there too one day! Thanks for the insights into the tea ceremony. Japan has always fascinated me and I long to go there. One of these days!! Hopefully in April when I can see the cherry blossom in bloom. I attended Lotus Lantern Festival in Seoul this year and did get a glance at temple life (Buddhist temple). I tasted tea and a very delicious mildly sweet snack at one of the hundreds of stalls there but boy did I miss on the tea ceremony. After reading your post I'm tempted to try the whole experience at the temple now! Beautifully written post, I felt like I was there in Japan experiencing this for myself! I was always curious to know about the tea ritual as i had heard it from a friend.... and was indeed exciting after reading it and seeing it in the beautiful pictures.